La Cabaña is one of the home stores we stopped in on our exploration for Tucson-inspired decorations. This store is full of folk art and knick-knacks that will add tons of character to any room. Home decor items for sale at Now or Never at the MSA Annex, 267 S Avenida del Convento, on May 2, 2018. Quinn's clients often want desert scenes when they commission pieces from her. Carly Quinn holds fired tile that is almost ready for assembly. These bronze animals at La Cabaña will cost you $150 a piece (eek). But we love the little treasures like this that you'll find throughout La Cabaña. These geometric planters ($44) give you some minimalist flair. Plus, Now or Never is fun to explore. These flower arrangements at Bloom Maven are available for purchase. They're a bit pricey but truly lovely. La Cabaña is one of those stores packed with treasures. Pop Cycle is a women-owned business on Fourth Avenue. Pop Cycle even has Tucson-themed furniture. Tucson has plenty of artists and business owners who make and sell pieces that pay tribute to all things local — or at least all things cactus. And since we love supporting local makers and do-ers, we thought we'd highlight a few that can help you brighten up your space. In your hunt for Tucson decor, Pop Cycle needs to be your first stop. 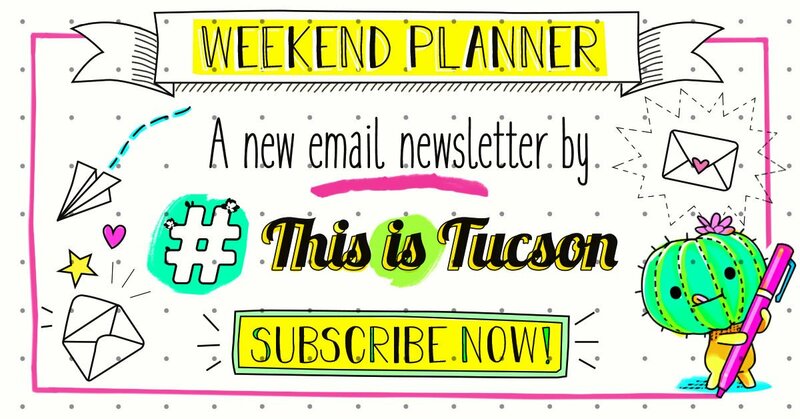 This is a desert-lover's wonderland, with beautifully framed cactus prints, an angry cactus pillow for your couch, Tucson-themed light switch plates and trays and even end tables with cactus art for tabletops. You could go crazy in here. Pop Cycle's goal is to promote pieces made locally and out of recycled materials. It's so much fun. Address: 422 N. Fourth Ave. Hours: Monday-Thursday, 11 a.m. to 6 p.m., Friday-Saturday, 11 a.m. to 7 p.m. and Sunday, 11 a.m. to 5 p.m..
One of the new shops at the MSA Annex, Now or Never sells modern and minimalist pieces for your home. You'll find lots of bowls and platters in geometric shapes and pastel colors. We also loved the Southwest-inspired blankets draped over several ladders and the hanging cactus planters ($44) we found tucked in the back of the store. Hours: Wednesday-Saturday, 11 a.m. to 6 p.m. and Sunday, noon to 4 p.m.
Visit nowornever.shop for more information. Head down to the original Mercado San Agustín to check out this eye-catching shop. Even if you don't buy anything, this shop is worth exploring. Folk art hangs from walls and carefully balanced stacks of Talavera pottery fill tables. You'll find a mix of antiques and local artwork here. We particularly liked solid bronze, palm-sized desert creatures — think javelinas and jack rabbits (about $150 each). Hours: The store is closed Mondays but open by noon the rest of the week. Closing hours vary, so call in advance. For more information, call 404-9008. Tucson artist Carly Quinn makes custom hand-glazed tile murals in her shop/studio just north of 5 Points Market and Restaurant. Although commissioning a mural can be expensive, she also sells individual tiles that you could use, say, as house numbers. Many of her designs use sunset colors and pay homage to desert imagery. Address: 730 S. Russell Ave. Hours: Tuesday-Friday, 11 a.m. to 5 p.m and Saturday, noon to 4 p.m..
For more information and to find her Etsy shop, visit carlyquinndesigns.com. Feeling them desert vibes? Tag someone who needs this sign. Orange and teal skies, rugged mountains and blooming cacti outlined in thick black marker. Annotated Audrey's artwork will make you love the desert just a little bit more. The wood slice signs ($20) that she makes will brighten up a front door or entryway with their welcoming messages: "Desert vibes," Chase the sun," and "Everyone is welcome." Follow her on Facebook for updates on where to find her in person or shop online at shop.annotatedaudrey.com. Eight of the 13 planned businesses will open this weekend at the Mercado Annex west of downtown. It's almost fall, which means open-air shopping and pumpkin spice everything.